You can use this ESL Sitemap to find your way around the Teaching ESL to Adults website. If you still cannot find what you need, try my ESL Search Engine page to search this site and/or search the Internet for more EFL/ESL-related information. Here's a list of the most useful ESL acronyms and abbreviations for ESL and EFL teachers. Differences between EFL and ESL primarily relate to where English is being taught. TEFL is taught in a non-English speaking country. TESL is taught in an English-speaking country. A list of the basic qualities and characteristics of a good ESL teacher or tutor. A description of the basic duties of ESL teachers. Work settings include universities, adult schools, K-12, non-profit organizations, private tutoring, etc. Tips on how to start teaching ESL. ESL/EFL teachers can work in universities, public schools, private language schools, and as private tutors. What to look for when choosing a TESOL, TESL, or TEFL course online or on-site. Which of these two TESOL certificates is best for you? What does TEFL accreditation mean and is it important in choosing a TESOL course? Alphabetical list of all CELTA course locations around the world, with contact information. English past tense pronunciation is often challenging for ESL or EFL students. Simple Past Tense verb endings have three endings: /id/, /t/ and /d/. One of the first steps in teaching pronunciation to ESL students is teaching the concept of voiced and unvoiced sounds. This will help with past tense pronunciation and other pronunciation challenges. ESL students need to be taught how to determine whether a past tense verb has a voiced or unvoiced -ed ending. This teaches the student how to correctly pronounce Simple Past tense verbs. How to use popular tongue twisters for pronunciation practice for ESL students. Here's the verb tense list you need for teaching ESL to adults. The basic verb tenses are Past, Present and Future, but there are a total of twelve basic grammar tenses that need to be taught. Here's a comprehensive list of irregular verbs for you and your English language learners. When teaching ESL verb tenses to adults, verb conjugation is only the beginning of the lesson. You also need to teach the functions of the verb tenses, as well as each form of the verb tense. Teaching Simple Present verbs to ESL students involves more than just verb conjugation. Form and function are also essential elements of any ESL lesson on the Simple Present tense. Forming simple past tense verbs is only part of what ESL students must learn to master past simple verbs. Future Simple Tenses are fairly easy for ESL students. Verb conjugation of the Future Simple is easy. ESL students have difficulties knowing when to use the simple tense or "be going to." Present progressive conjugation requires use of an auxiliary verb and a main verb. Besides conjugation, ESL teachers must also teach form and function of each verb tense. The best teaching ideas for the past continuous verb tense and teaching it to ESL students must include verb conjugation, verb form and verb functions. The ESL Future Continuous is used to talk about an activity that will be in progress at a certain point in the future. The Simple Future can also be used with little or no difference in meaning. Using "Will" or "Be Going To"
Future Simple tenses include "will" and "be going to." "Will" is used for predictions and willingness. "Be going to" is used for predictions and prior plans. Present Perfect lesson plans should focus on verb conjugation, verb form and, especially, the function of the verb tense. The Present Perfect has three functions in English grammar. Tips for Past Perfect lesson plans, including verb conjugation, verb forms and functions of the verb tense. The Simple Past is usually used by ESL students instead of the Past Perfect. Tips for Future Perfect lesson plans, including verb conjugation, verb forms and functions of the verb tense. The Future Perfect is used to talk about an activity that will be finished before another time or event in the future. Tips for teaching Present Perfect Continuous forms, verb conjugation and verb functions. The Present Perfect Continuous is used to talk about the duration of something that began in the past and continues until now. Its use can overlap with the Present Perfect. Tips for teaching the Past Perfect Continuous tense, including conjugation, forms and functions of the verb tense. The Past Perfect Continuous emphasizes the duration of an activity in the past. Tips for teaching ESL Future Perfect Continuous verbs. The Future Perfect Continuous tense emphasizes the duration of an activity that will be in progress before another time or event in the future. The best ESL lesson plans are learner-centered and focus on the needs of the student. Every lesson plan should have a topic, objectives, tasks, and an evaluation. A list of steps for developing lesson plans teaching reading to ESL students. How to prepare ESL reading activities and ESL beginning reading exercises. What is an ESL cloze exercise? ESL cloze exercises and worksheets can be used for lessons, quizzes and tests. ESL cloze worksheets can consist of sentences, paragraphs or passages and can be used for any ESL grammar point. Free ESL and EFL worksheets for beginners, intermediate, and advanced students. How to use worksheets as teaching tools. List of additional sites with 100's of printable handouts. How to use present tense verb worksheets for ESL or EFL learners. List of printable worksheets. An ESL textbook evaluation of essential ESL textbooks and ESL grammar books and dictionaries for ESL teachers and students. The Best ESL Dictionary is not specifically an ESL dictionary. The best English dictionary for ESL/EFL teachers and students is Longman Advanced American Dictionary. Learn why. This is a list of other websites I think are useful for teaching ESL and EFL. This is the page to sign up to receive a periodic email from me with additional tips and tools. 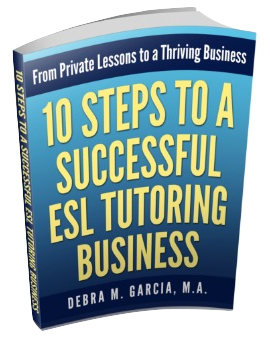 Plus you'll receive a free book of ESL worksheets for adults. About "Teaching ESL to Adults"
Here's information about the "Teaching ESL to Adults" site and the ESL teacher behind the site (which is me, Debra). This is the contact page for this site. Please contact me if you have any corrections, questions, suggestions, or comments about this site. This is the page for other webmasters to submit websites for a possible link exchange. Even if you're not a webmaster, if you find a site that you think would be a great ESL resource for others, please let me know. Okay, I've let this page get behind, but there are a couple of good snippets there.